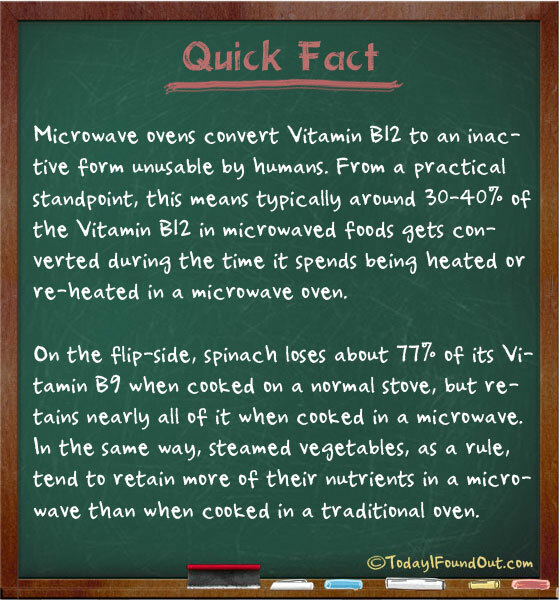 Microwave ovens convert Vitamin B12 to an inactive form unusable by humans. From a practical standpoint, this means typically around 30-40% of the Vitamin B12 in microwaved foods gets converted during the time it spends being heated or re-heated in a microwave oven. On the flip-side, spinach loses about 77% of its Vitamin B9 when cooked in a normal stove, but retains nearly all of it when cooked in a microwave. In the same way, steamed vegetables, as a rule, tend to retain more of their nutrients in a microwave than when cooked in a traditional oven.